Antineo determines the impact of your anticancer agents on the cell cycle. We provide a personalized protocol to study the cell cycle phases distribution using propidium iodide (PI) staining or BrdU staining for S phase analysis. 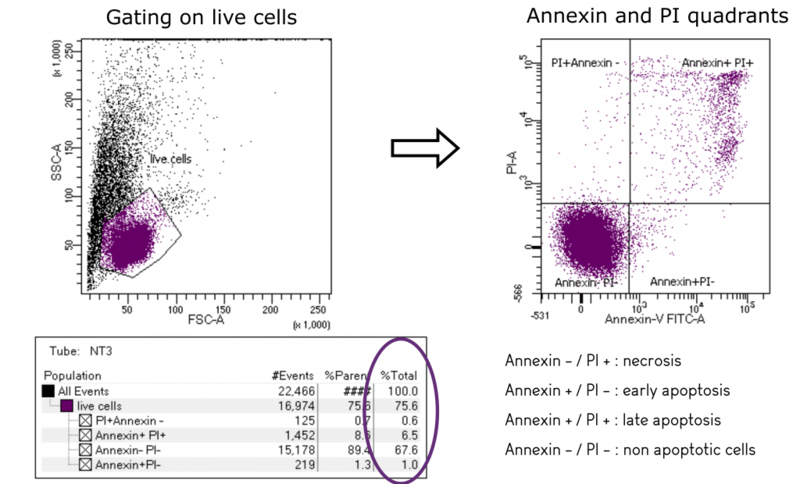 To better describe the activity of your agents we determine the apoptotic status of cells exposed to your compounds, using Annexin V/PI staining and by the analysis of caspase-3 and pro- or anti-apoptotic proteins (such as Bcl2 family proteins). Antineo is able to complete the data obtained in end-point assays by continuous-monitoring assays (see continuous-monitoring).